What’s the verdict: Relatively obscure in the West, in the East Dragon Inn has cast a long shadow over wuxia (martial arts hero) movies. In ambition, execution and artistry Taiwan’s answer to Kurosawa’s Seven Samurai, without Dragon Inn there conceivably could be no Ashes of Time, no Crouching Tiger, Hidden Dragon, no House of Flying Daggers. Director King Hu had just come off the smash hit Come Drink With Me at Shaw Brothers Studios and turned down the chance to work with the studio again to make Dragon Inn in Taiwan for the Union Film Company (although Shaw had their own 1967 hit with One-Armed Swordsman). A tour de force of action and romanticism, occasional moments of camp and unintentional giggles arise, but this is a film by a director at the height of his talents. An opening voiceover hurls a huge amount of character and story background at the audience, but fear not, the story is goodies vs. baddies simple. And who is noble and who is sneaky is signposted by costume, theatrical performance styles, music, and camera angles as well as how they behave in combat. All this is where Dragon Inn garners its reputation as a classic and it is a cause for celebration the film is now available in the UK after decades of poor quality grey market copies did scant justice to its brilliance. 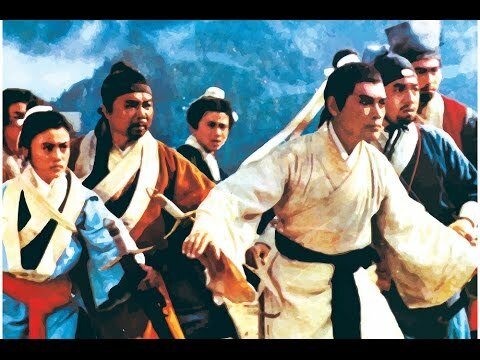 Essentially a siege movie centred on the titular hostel, Hu’s screenplay concocts various ways to shift power between Zhao’s forces and the honourable warriors protecting the children. Swordplay, arrow battles and martial arts are all thrown into the mix. Action designed by Peking Opera choreographer Han Ying-chieh is matched by Hu’s dynamic direction; his camera travels with the fighting in long takes, swings low and high to enhance danger or orientate the audience, and frequently smashes continuity so characters make impossibly quick jumps through space in the heat of battle. All of this is exhilarating to watch and executed before the advent of wirework, although hidden trampolines do some superhuman assists. Shih (most recently seen in disappointing wuxia The Assassin) is on full charisma offensive as Xiao, repelling hapless soldiers without bothering to stand up from his dinner, often using an umbrella in place of a sword and dazzling friend and foe with a disarming smile. Proving Hu is not solely interested in the action, Xiao’s garb is mirrored by Zhao’s first lieutenant. A late in the day attempt by Zhao to lure Xiao to the dark side suggests the lieutenant is Xiao’s alter-ego, an example of what he could be become if his righteousness slips. Matching Shih is Shangguan as one of the loyalists protecting the children. A skilled martial artist, Shangguan’s skill in the action scenes matches the legendary Cheng Pei-pei in Hu’s Come Drink With Me. 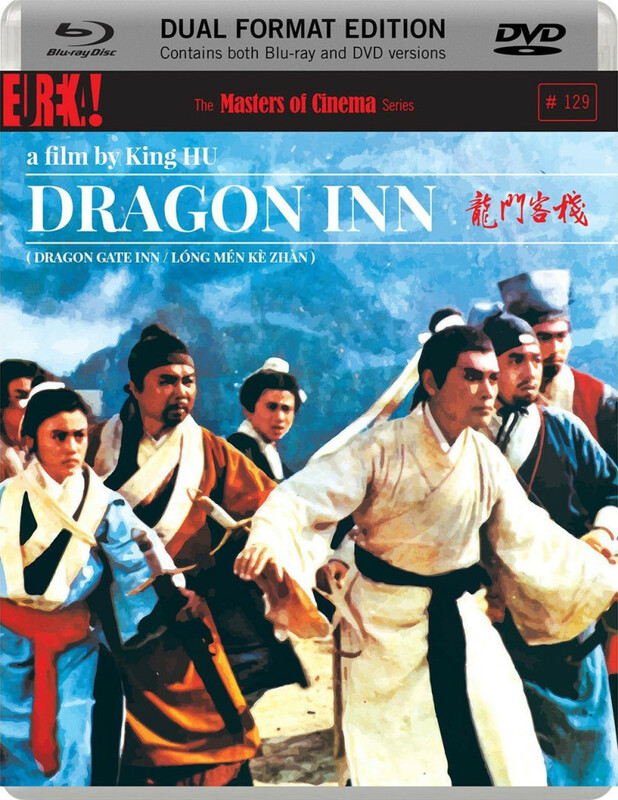 An essential purchase for any fan of Eastern cinema, Dragon Inn is also one of those rare films where the remake almost matches the original. Raymond Lee’s 1992 New Dragon Gate Inn uses the central plot to make barbed comments about China’s then imminent reclaiming of Hong Kong and boasts a stellar cast including Tony Leung Ka-fai, Brigitte Lin, Maggie Cheung and Donnie Yen. Dragon Inn’s DNA can also be felt in the trailer for Tarantino’s upcoming The Hateful Eight, while its climax was echoed years later in Tarantino’s grindhouse offering Death Proof. King Hu himself would follow Dragon Inn with the Palme D’or nominated masterpiece A Touch Of Zen and other great films including The Fate of Lee Khan. Most of his movies are not easy to find, so jump on this welcome release now. Picture: Taken from the 4K transfer, Eureka’s Masters of Cinema region B Blu-ray is a joy to watch. Capturing the crisp, clear cinematography, colours and detail leap off the screen, doing full justice to Hu’s inventive direction. The Blu-ray is dual format, also containing a regular region 2 DVD of the movie. Extras: The chief disc extra is David Cairns’ 15 minute video essay, exploring how the film builds suspense and uses different action sequences to tell the story. Insightful and entertaining, the only downside is it makes you yearn for a full commentary from the critic. A low-quality newsreel clip from the time is worthwhile in its depiction of Dragon Inn fever that was sweeping Taipei when the film premiered. A 36-page booklet features illuminating essays by contributors including Asian cinema expert Tony Rayns and Edmond Wong.